We set about getting to know Sarajevo with a morning walk through the Old Town area. Bosnia existed under the control of the Ottoman empire from as early as the 15th century up until the late 19th century when it was ceded to the Austro-Hungarian empire; and the Old Town area reflects this history explicitly. Ottoman architecture is ubiquitous throughout its multiple Mosques, cobblestone streets and narrow lanes lined with shops selling crafts of all kinds. The picture above portrays one of the craft traditions that has remained generally unchanged by the hands of time, the Coppersmiths. Drifting down Kazandziluk, or Coppersmith’s Street, an air of times past is cultivated by the glare of the sun dancing on hand-made turkish coffee sets and the pleasant tapping of tool on metal emanating from the shops into the enclosed thoroughfare. We enjoyed meandering around Old Town and the surrounding areas, and were struck by how the architecture reflected the shift of power in the city’s history. As we walked away from Old Town in the direction that Sarajevo expanded all those years ago, we could see the buildings gradually shift into the Austro-Hungarian style. In the distance, Eastern Bloc behemoth structures loomed over the newer parts of the city. Sarajevo is a great place to examine the evolution of architecture and power in a near perfect linear direction. 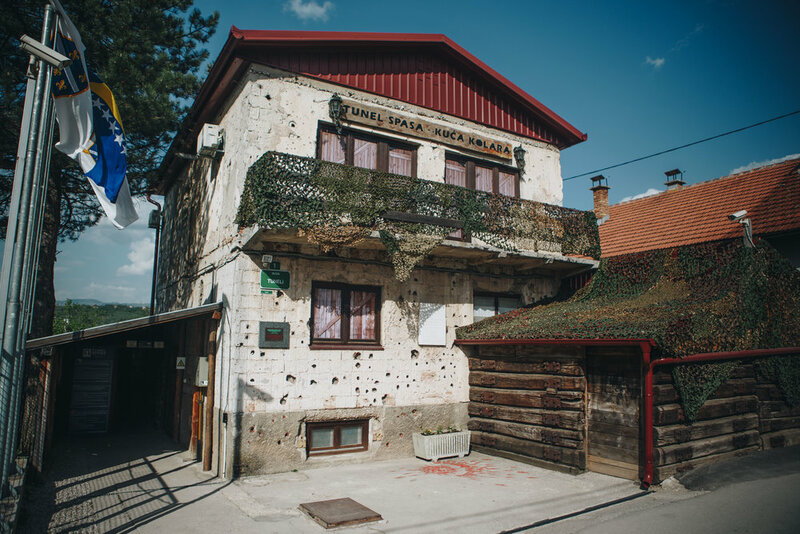 Pictured above is a nondescript house on the outer fringes of Sarajevo that became one of the most important locations in the recent history of the entire Balkan region. Underneath this house was the end of a 340 meter tunnel that is one of the sole reasons Sarajevo survived a violent, 4 year long siege. Without turning this post into some kind of academic essay, the general context of the siege was as follows: Following the death of the widely beloved dictator Marshal Tito, ethnically diverse Yugoslavia began to collapse and waves of nationalism erupted (side note: we were struck to find that many conversations we had alluded to Bosniak's views of the communist Yugoslav times as their golden age, a period they pine for and a political system they'd prefer still existed) . Some Serbs in the area saw this political vacuum as an opportunity to realize the vision of a “Greater Serbia”. Bosnia, a very demographically varied country, declared its independence from Yugoslavia and was recognized by the EU as a sovereign state in April of 1992. Already militarized Serbs and Bosnian Serbs were not a fan of this victory for an ethnically diverse Bosnia, and in addition to sporadic fighting all over the country, surrounded its capital in an effort to gain control of this important area. The siege that followed could have easily been the end of the vision of a diverse and free Bosnia, but Sarajevo's industrious citizens weren’t going to let that happen. Over the course of 4 months and 4 days during the siege a tunnel was excavated in order to link the inhabitants of Sarajevo with the outside world, and, more importantly, food and supplies. The Tunnel of Hope is widely recognized as one of the key reasons Sarajevo was able to stand until NATO stepped in with some air-strikes and eventually the Bosnians were able to break the Serbs’ vice-grip on the city. We visited the Tunnel and many other important sites on the Meet Bosnia Fall of Yugoslavia, Sarajevo Siege Tour. The tour was a great way to get to know a wide swath of the city quickly, and then decide which sites and areas to come back to and explore in more depth later.